You may be thinking about a fall getaway that allows you to take a break from the norm. Rocky Point in Sonora is an excellent choice, and September is the perfect time to fit this spot into your schedule. 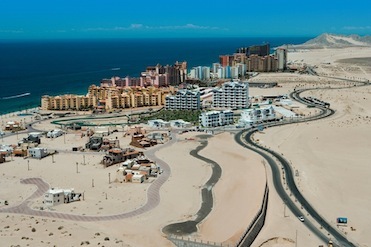 You will need your passport and Mexican insurance for Rocky Point before crossing the border. Your Mexican auto insurance for Rocky Point can be handled quickly from your computer right before you leave or weeks in advance. The following are three great reasons to make Rocky Point your destination of choice this September and in coming years. Just remember to have your Mexican car insurance for Rocky Point up to date before you cross the border. Need to learn more about Mexican insurance for Rocky Point? Visit MexicanInsuranceStore.com. With back-to-school activities in full swing, the college crowd is less likely to be crowding the beaches at the popular resort city. Spring break can be a challenge for those who want some down time without a lot of noise and fuss, but September is a great transition time. Families are also more likely to wait for spring or summer to head south of the border, meaning that the typical tourist lull that follows Labor Day can make for a wonderful time of exploring Rocky Point on your terms. Although the summer months continue to draw visitors to the area, temperatures can be tough to deal with. However, September is a great time for those who still want a bit of heat without roasting. You’ll find that there are many beautiful beaches to explore and fantastic pools to try out depending on the resort at which you stay. Pro Tip: Mexican insurance for Rocky Point is required to drive on the toll roads! While Mexican auto insurance for Rocky Point might not keep you out of accidents, well-timed travel could help in that area. Avoiding heavy travel periods can allow you to drive at a leisurely pace without having to deal with huge numbers of hurried motorists. Your Mexican insurance for Rocky Point also allows you to access help quickly if you have a serious incident or if you deal with an unexpected vehicle problem on your way to or from the resort community. Keep your Mexican insurance for Rocky Point up to date so that you can make a return trip soon. Mexican insurance for Rocky Point from MexicanInsuranceStore.com includes Roadside Assistance for peace of mind! Buying Mexican insurance will help you avoid the expensive cost of accident or being put to jail for a long time. Rocky Point is the right place to recharge. It offers memorable moments and activities you can’t enjoy from other places. Get quickly your Mexican car insurance for Rocky Point and head to Mexico.